Seven of Frank Vanzant’s students placed in the top 10 in the category of calculus/advanced topics. 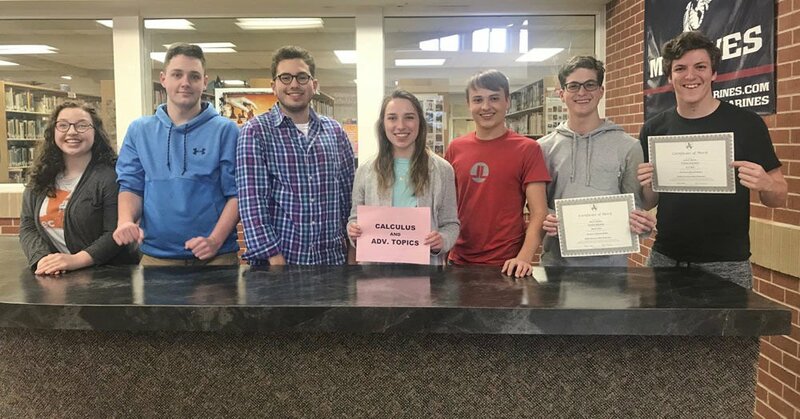 From left are Abbie Daniel and Cameron Haley (tied, ninth place), Cooper Yoder (seventh place), Aimee Christopher (fifth place), James Wagnon (fourth place), Sam Uselton (second place) and Caleb Purdue (first place). 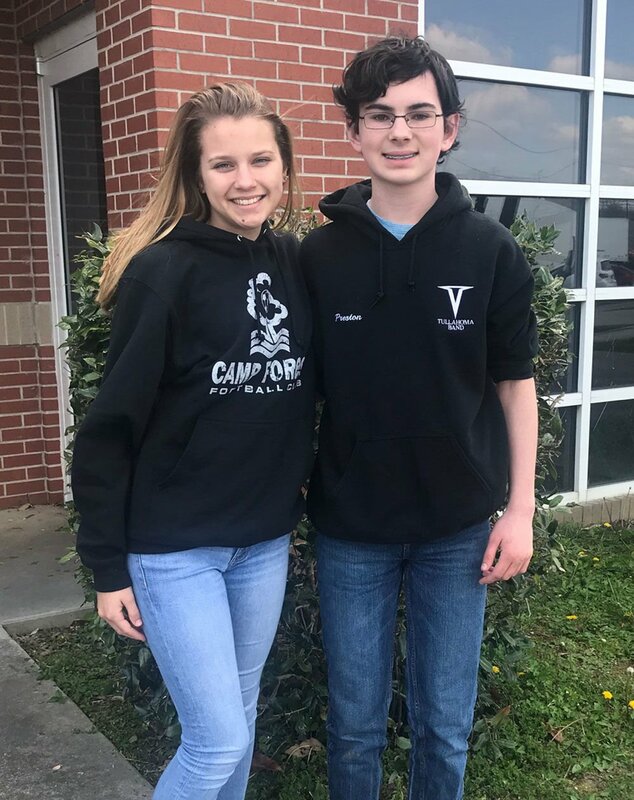 Kaitlyn Kraabel and Preston McGee took home fourth and third place, respectively, in algebra II at the Tennessee Math Teachers Association annual math contest, held on Tuesday, April 10. They are part of Amber Charboneau’s algebra II class. Tullahoma math students have once again proven their mathematical might at a regional math competition hosted by the Tennessee Math Teachers Association (TMTA), according to school officials. According to Frank Vanzant, the AP calculus teacher for Tullahoma High School, students from THS and East and West Middle schools took home a grand total of 22 out of 40 top-10 places in the math competition. Tullahoma math students excelled at a regional math competition hosted recently by the Tennessee Math Teachers Association. In the subject of precalculus, six Tullahoma High School students captured several places in the top 10. Front from left are Spencer Yoder (first place), Kobe Guo (third place) and William Arnett (fifth place). In back are Kaicie Kidd (sixth place), Eleni Pisinos (seventh place) and Keilee Northcutt (ninth place). These students are taught by Kim Carter. The contest is held each year and conducted at various regional testing centers throughout the state, with awards given to the top ten students in each category of competition. According to TMTA’s website, the organization has held a contest every year since 1957. THS students competed in the categories of algebra II, precalculus and calculus/advanced topics, taking half of the 30 top-10 spots. Students from East and West, who competed in the algebra I competition, took home seven of the ten 10 spots. These regional competitions routinely see more than 300 of the state’s top math students from middle and high schools competing, so to see TCS students take the majority of the top ten spots only further highlights the success of the math curriculum here in Tullahoma, according to Vanzant. Vanzant said that the continued success of TCS students at the math contest is a reflection of the stellar honors and AP math program the district has in place. “To me it just puts a seal of approval on our honors track that we have [at the high school],” Vanzant said. Vanzant credited the foundation of the math program’s rigorous standards, which start at the middle school level. “It starts with East and West Middle School – eighth grade – all the way up through our calculus program,” he said. All they’re doing is teaching their students the required curriculum – any further knowledge or success is completely up to the students themselves. Vanzant said several of his calculus I and II students would find time to meet with one another and discuss old contest materials used for contest preparation – even coming in before school two days a week on their own time. “There’s a lot of pride and self-motivation here,” he said of the students’ work ethic. In addition to winning the majority of their regional competition, several of the students might also be in contention for top state honors, according to Vanzant. All the regional scores are forwarded to TMTA, which then enlists hundreds of volunteers to hand-grade the results and calculate scores. Depending on how high the regional scores are, there is a possibility – a strong one – that Tullahoma High School would see one or two of its students take top state honors. There is precedent for this, according to Vanzant, who said that THS has had one or two top state finishes for the last several years – particularly in the category of calculus/advanced topics. “We’ve had several students from Tullahoma place either first or second or third in the state for the past several years,” he said. In 2017, Kelsi Burt took home a fourth-place state finish in the category. Alec Yen had a first-place state finish in the category in 2016, and Will Arnett had a third-place state finish in 2015. The category has seen no less than 10 top-10 finishes for THS students in calculus/advanced topics since 2013, according to the TMTA website. Students will have to wait until September to be notified of their statewide finishes, however, as the final state results are not announced until TMTA’s annual conference in the fall. That THS will have at least one winner in one category is something everyone can count on. Middle school students competed in the area of algebra I, taking home seven of the top 10 places. Students from East Middle School captured five of the seven places, including first and second place. West Middle School students took home the other two top-ten places. The winners are: Franklin Zhang, EMS, first place; Cannon Emory, EMS, second place; Lintao Niu, WMS, third place; Jacob Bennett, EMS, fourth place; Garnet Cuello, EMS, fifth place; DJ Dillehay, EMS, sixth place; and Elizabeth Arnett, WMS, eighth place. They were taught by Trent Stout (EMS) and Faye Neel and George Jensen (WMS). High school students competed in three categories: algebra II, precalculus and calculus/advanced topics. Two THS students placed among the top 10 in algebra II. Preston McGee took home third place and Kaitlyn Kraabel captured the fourth place position. They are taught by Amber Charboneau. In the precalculus competition, THS students took home six of the top 10 spots. Winners are: Spencer Yoder, first place; Kobe Guo, 3rd place; William Arnett, fifth place; Kaicie Kidd, sixth place; Eleni Pisinos, seventh place; and Keilee Northcutt, ninth place. These students are taught by Kim Carter. Seven of Vanzant’s students took home top 10 finishes. They are: Caleb Purdue, first place; Sam Uselton, second place; James Wagnon, fourth place; Aimee Christopher, fifth place; Cooper Yoder, seventh place; and tied for ninth place are Abbie Daniel and Cameron Haley.